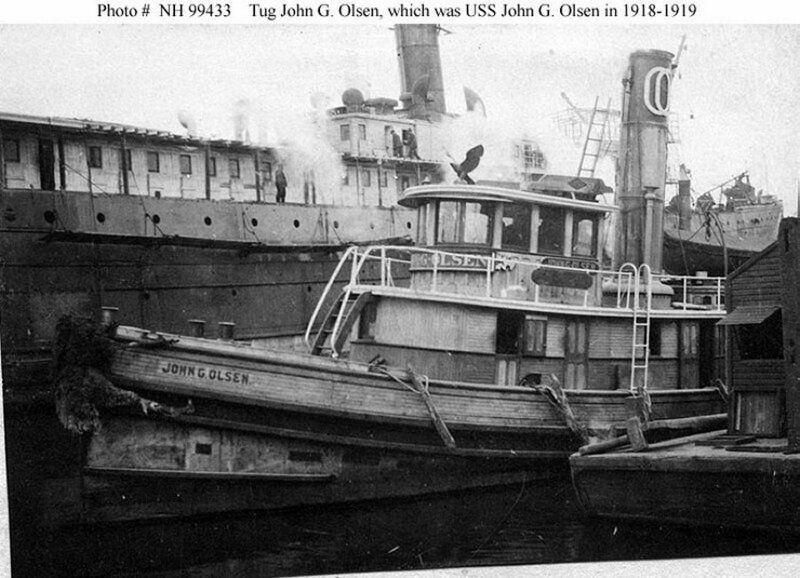 Tug: Built in 1916 by Hawley Miller, New Baltimore, NY; Acquired by the Navy, 16 April 1918 and commissioned the same day; Returned to her owners, the Olsen Water and Towing Co. of New York 28 August 1919. (The Olsen Water and Towing Co. was sold to Moran Towing of New York in 1950). Fate unknown. Specifications: Displacement 61 t.; Length 76'; Beam 19'; Draft 8'; Speed 10 kts. ; Complement unknown; Armament none; Propulsion steam, one shaft. 130k In port, possibly in the New York City area when she was inspected by the Third Naval District on 3 March 1918. 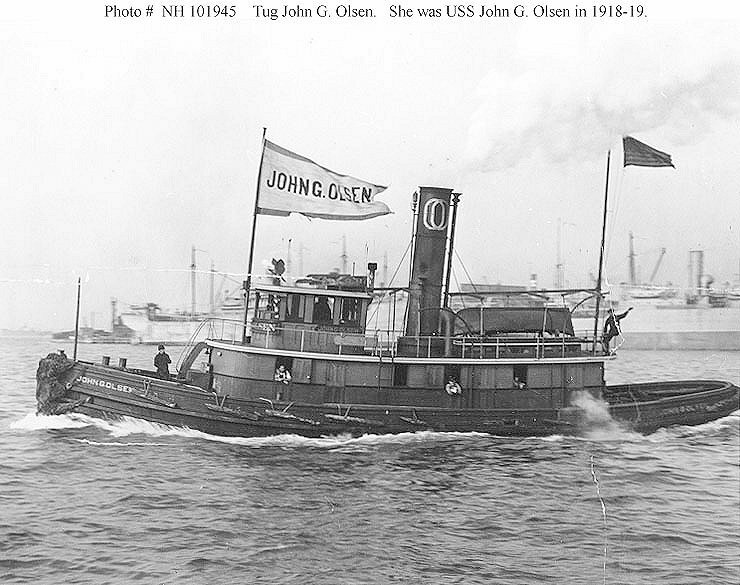 Dictionary of American Naval Fighting Ships History: John G. Olsen (SP-2377), a steam tug, was built in 1916 by Hawley Miller, New Baltimore, N.Y., and acquired from her owners, Olsen Water & Towing Co., of New York, 16 April 1918. Her first commanding officer was Ens. G. Montague, USNRF. Assigned duty in the 5th Naval District, John G. Olsen steamed from New York to Norfolk, arriving 23 April via the inland route. There she took up duty as a tug and general purpose harbor ship in Hampton Roads for Naval Overseas Transportation Service, a vital organization in the transport of men and material to France. After the Armistice, she served at Indian Head, Md., before being returned to her owners 28 August 1919.